Share the post "Great Beauty has come in Two’s"
I had another soft landing for a closing earlier this morning and I’m confident the buyer will do great things with the home he purchased. As far as I’m concerned, there’s a great upside potential with it since it has great bones and in a good re-sale neighborhood. He’s one of those rare buyers who’s able to look past the out-dated cosmetics of a home and see what real un-locked values lie waiting to be revealed with key updates. My suspicions are coming true of late to where more first-time buyers are finding everything in their price ranges all picked over and not worth buying due to being over-priced or needing too many repairs. This situation has been in the making for some time and it’s partially due to a number of young buyers not willing and not knowing how to make repairs. There’s a great fear factor with them because they haven’t a clue when it comes to estimating how much some of the simplest of updates will cost. Sometimes just a few solid suggestions and a bit of a nudge can get things done more easily and cost effective. I visited with a client who’d considered tearing out his mid-century kitchen cabinets, and having looked more closely at them, I found them to be exceptionally well built and had all smooth front doors and drawers. There must have been six layers of paint on the set; including the hardware. I suggested he scrape all the paint off them and place all the hinges and pulls in a pan of paint remover. He called today for me to come take a look at his project and I was pleasantly surprised to find he’d scraped all the doors and drawers, sanded and painted them a soft pearl white. He ordered a new countertop that’ll go with the colors, and showed me the hardware he’ll be re-installing. I was shocked to find how expensive and well made that hardware must have been at the time. When those cabinets are finished, they’ll look far better than anything purchased new and for thousands of dollars less. It all goes back to looking at other options and possibilities rather than going out and buying new. 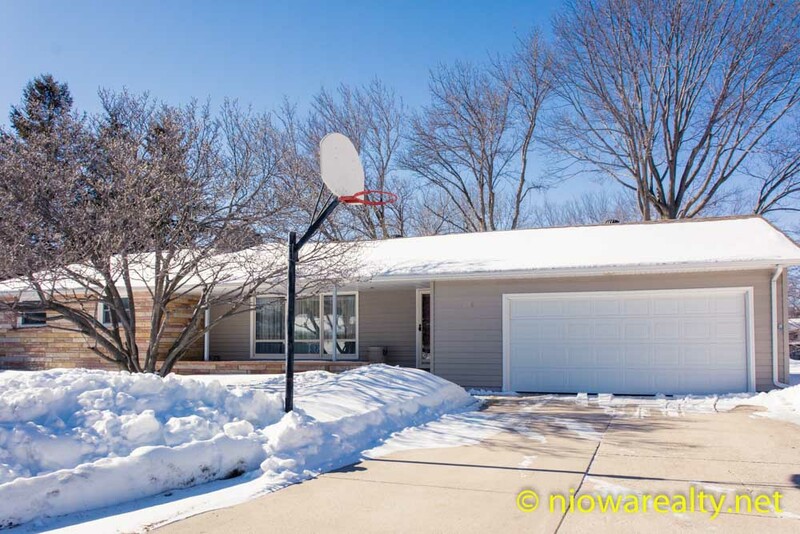 I listed another fabulous home today which is located at 216 Meadow Lane here in Mason City. I can’t begin to tell you how exceptionally well built the home is along with it being situated on Cheslea Creek’s lagoon. The views are spectacular from the kitchen, dining, and family room. The home is far larger than it appears from the street, and when I looked at it for the first time, I’d figured someone had it custom built back in 1961. Well, after doing a little research, I found that it was ordered built by one of the partners of Fareway who was instrumental in opening many stores in their grocery store chain. He decided to remain in Mason City until his retirement. I’m sure he and his wife planned everything they wanted for their new home irregardless of cost. Even the bedroom hallway is wider than normal. His wife must have liked to cook as well as entertain due to the size of the kitchen/dining area, the living room, and the family room. The room and window placements in the home is all about light and views—especially to the creekside. I’ve planned a public open house for it this Sunday from 1:00 – 3:00 PM and I’m sure everyone will be “Wowed”. So now we have it. Great beauty has come in two’s for everyone this weekend with my Saturday and Sunday public open houses. Click on the links below to view these two exceptionally well built homes.